I will be participating in this Vintage Fair at Journey East with lots of vintage costume jewellery! Will be bringing Art Deco, Mid-century, Sarah Coventry, Trifari, Coro, rare designs, brooches, necklace, earrings, bracelets, and sterling silver. Price range $15.00 - $180.00, something for everyone. Come down and have a look, and check out the other exciting vendors! 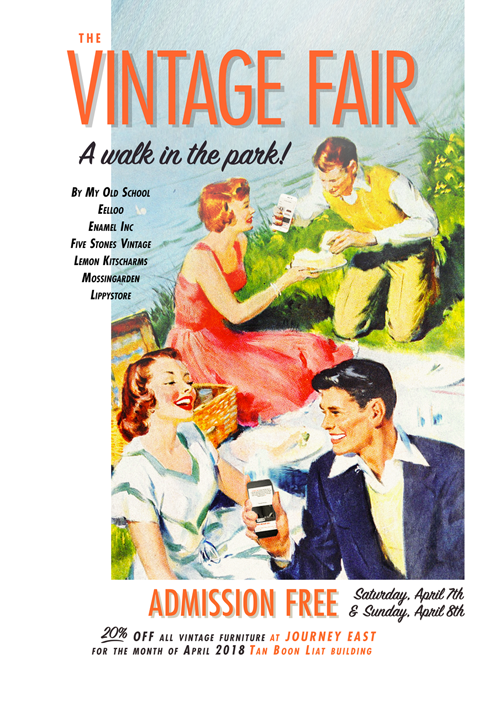 Feel free to come in your best "Vintage A Walk in The Park" themed attire =) It will be comfy, air-conditioned and fun! As one of Singapore’s most established vintage furniture destinations, we have teamed up with some of the best of Singapore’s vintage community yet again to bring you a fantastic and nostalgic weekend on April 7 and 8: the much-anticipated and highly-successful Vintage Fair weekend popup returns to Journey East for the 4th year! This year’s vintage fair, themed ‘A Walk In The Park’, is inspired by a relaxed retro Sunday, and promises an enjoyable retro experience. Come ready to pick up rare finds such as authentic and inspired vintage memorabilia, and fashion, as well as and décor accessories.